The 410 bus route from 22nd Street Station to Richmond is one of my favourite routes to catch up on missed sleep due to its long travel time and relatively few stops. This time, however, disaster struck as I failed to fall asleep while riding the 410 and began to feel carsick about 15 minutes into the ride. By the time I arrived at Richmond's Sea of Malls, I was terribly dazed and nauseous. I haphazardly stumbled into the closest Staples and looked at their clearance sections until nausea subsided to hunger. There's no better medicine for curing nausea than looking at sale items! Tokyo Joe's Sushi Factory resembles a cheap place to get some quick sushi, but after looking at the menu, I thought to myself, "This ain't cheap at all." The staff were Chinese and seemed to be receiving a high volume of calls for take-out orders, which made me hopeful that the food was going to be fresh and delicious. I tried to order a good variety of items that looked interesting to me, but perhaps I got a little too excited while doing so because the waitress had to warn me that I might be ordering too much food. However, I was rather hungry, so I insisted on my initial order. I ordered one of their teriyaki sets, which came with a Miso Soup, a Chicken Teriyaki, and four pieces of sashimi. The Miso Soup was garnished with green onions and tofu. The green onions were coarse and a little crunchy. 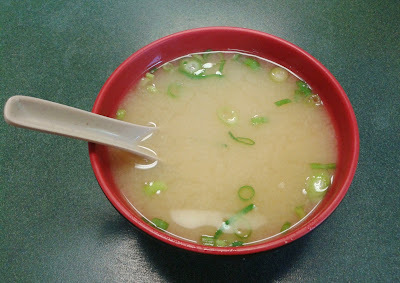 The consistency of the Miso Soup was quite light, but there was no overdose of salt. If you're a dine-in customer, the Miso Soup is free! Now, this is one huge Chicken Teriyaki! (If it doesn't look big to you at first, compare it to the size of the orange slice.) I can see why the waitress was concerned after all. For a normal person, this alone would be a complete and rather filling meal. 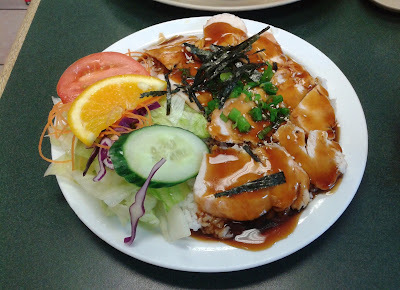 I really enjoyed the large pieces of perfectly cooked tender white meat as well as the seaweed and green onion on top. There was ample teriyaki sauce, which went well with the rice. The salad on the side was refreshing and came with a small dab of dill sauce. The rest of my food was neatly arranged on a large, round dish. All of the portion sizes turned out to be slightly larger than average. I found it amusing how they provided me with a huge amount of wasabi, which was in quite an unnatural colour. Unfortunately, the sashimi did not really live up to my hopes for freshness. Both types of sashimi were lacking in flavour, and the Tuna Sashimi wasn't particularly soft. At the very least, the Salmon Sashimi was sufficiently soft and both types of sashimi came in generous cuts. 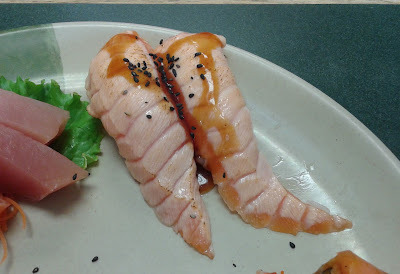 To match the weather, I ordered the Salmon on Fire, which consisted of two pieces of seared salmon sushi. I found the seared taste of the salmon quite weak. The sushi rice was also quite disappointing. Not only was it bland, but the grains of rice formed a few small clumps. The only redeeming factor was the large size of the nigiri. 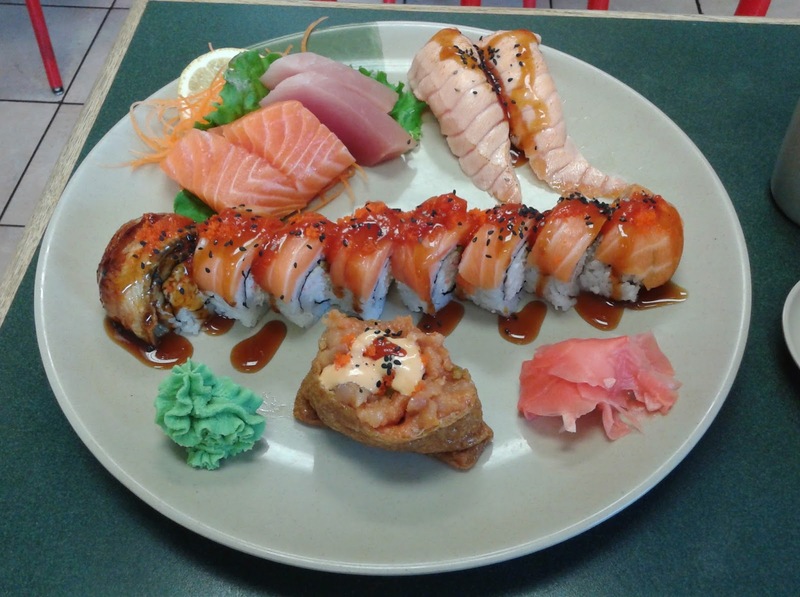 The Red Dragon Roll came with unagi and salmon on top of a California roll. Interestingly, they decided that one piece of unagi and seven pieces of salmon was the proper ratio. The unagi had a perfect planked-grilled flavour and the salmon was adequately dressed with teriyaki sauce so that I could no longer tell that it was lacking in flavour. The Soo Special consisted of an inari pocket filled with spicy tuna. This was my favourite item of the entire meal. The inari was especially tasty with a prominent sweet flavour, and it went surprisingly well with the generous helping of soft tuna, which provided a nice spicy kick. I don't know where they got the name from, but this was definitely better than Soo Beef Jerky! The service wasn't abundant, but I found it friendly. I enjoyed my visit since the hits made up most of my meal in terms of quantity, but I was a little concerned that the sushi rice and the sashimi were below average on the day that I visited. When I went to pay the bill, the waitress looked at me with a truly astonished expression after seeing that I had finished all of the food. Well, gluttony isn't exactly a problem, right? 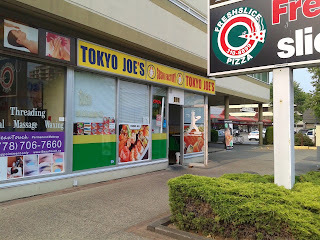 omg I just went to Tokyo Joe's the other day!! Haven't blogged about it yet because I want to try some more items!! The So special looks so yummy - I'll have to try that next time!! I just looked up the Chirashi Don on Tokyo Joe's website and it does look like it's a good value at $14.95! 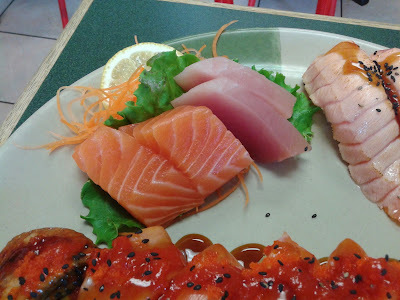 The two pieces of tuna and two pieces of salmon sashimi cost almost half the price ($6.95) if ordered separately! 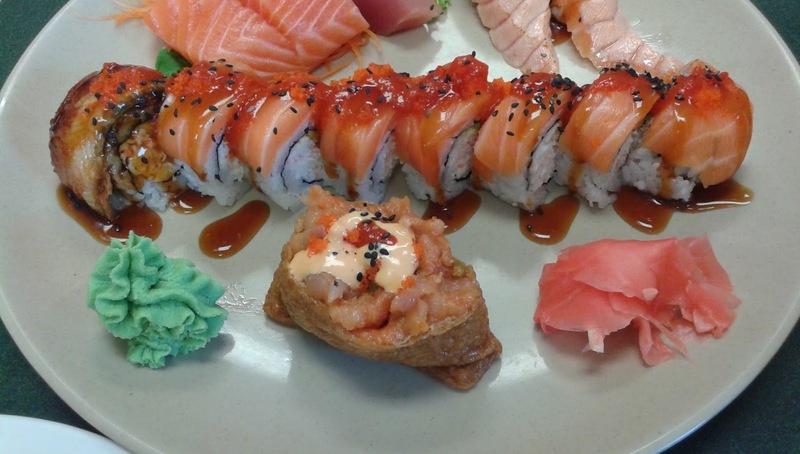 You should definitely try the Soo Special if you like inari! I wanted to try some of their Gomae too, but I had already had a Follow-Me-Foodie-sized meal. Maybe in a future visit! 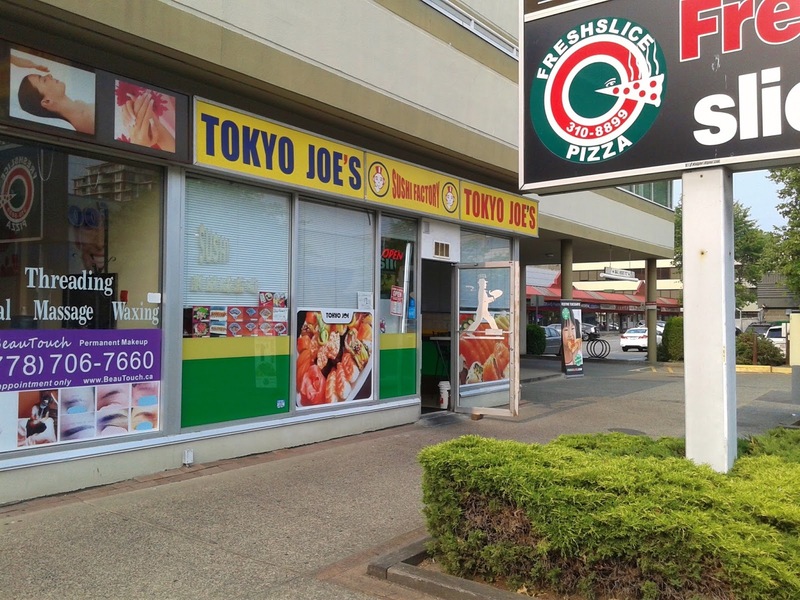 I look forward to reading your post on Tokyo Joe's!